If you are interested in massage therapy, sport and recreation management or even becoming a physical education teacher, we can help provide the starting point for your career. We are Australia's largest provider of teaching programs in sport and exercise science. Benefit from our close links with groups such as the Victorian and Australian Institutes of Sport, Western Bulldogs and the AFL. With our state-of-the-art, $68 million sport and learning precinct, you will enter a highly engaging, switched-on environment. Gain the skills to take your advance your career you can study at TAFE, degree or postgraduate level. The Certificate IV in Fitness gives you the skills to kick start your career the health sector, one of the fastest growing industries globally. Learn the practical skills of remedial massage as well as the theoretical knowledge required to assess your clients' soft tissue dysfunction. Prepare for a career in the sport and recreation sector and develop essential sporting skills and industry knowledge. Develop your skills in the sport and recreation industry gaining knowledge in project management, and facilitating and coordinating teams and groups. Be part of a growing demand for graduates with training in the field of exercise and biomedical sciences. Learn how the structure and function of the body influences and is impacted by exercise. Start your career in the sport and exercise industry with a course that delivers a range of subjects across the biological sciences, social sciences and humanities areas. Gain the knowledge and skills for entry into professional careers in exercise and sport science, rehabilitation, community fitness and health, and research. Prepare for your ideal career as a leader in fitness centres and community-exercise programs, with a Bachelor of Fitness from VU. Prepare for a career working in nature, with a Bachelor of Outdoor Education and Environmental Science from VU. Become a leader in nature-based education and recreation through practical study and work experience, with Victoria University's Bachelor of Outdoor Leadership. This course provides knowledge and skills in physical education and sport science through a range of subjects across various disciplines. Gain the skills for a career in the sports, physical recreation and outdoor-adventure sectors with a Bachelor of Sport Management at Victoria University. This double degree prepares you for employment in both the commercial business sector and the sport, exercise and active recreation sector. Join Australia's leading sport university and gain the very best knowledge for a professional career in the sport and exercise industry. This course delivers a balance across the biological sciences, social sciences and humanities for a career in the sport, fitness, exercise and human movement professions. This double degree provides you with the capabilities and understandings of human movement, and the structure, practices and participant needs of the Australian sport, exercise and active recreation sector. The Bachelor of Youth Work/Bachelor of Sport Management course aims to produce competent youth workers and sport management professionals who have practical management and leadership skills. Work with football clubs to improve player performance, with a Graduate Certificate in Performance Analysis (Football). The Graduate Diploma in Sport Business and Integrity will teach you to fulfil the dual responsibilities of managers in professional and community sport. In this course you will gain high-level skills to implement sport programs and prepare for the pressures and complexity of contemporary sport management. This course addresses the continuing concern about sport’s capacity to act on the positive social values it has traditionally upheld. Our sport-strategy course allows experienced sport-management professionals and recent sport-management graduates to build upon their existing credentials with the latest knowledge and skills. Gain expertise that supports your passion for football and take a step towards a sport-science or high-performance career. This course will provide you with a holistic education in the field of football science. It has an applied theoretical focus as well as practical experience. Gain a solid foundation in research methods before undertaking a thesis related to health or sport with the Master of Applied Research. Expand and develop specialist knowledge in your chosen field of research and provide evidence of independent thought and the ability to manage a research project. Undertake your PhD in a world-leading research centre. Victoria University's Institute for Health and Sport (IHES) provides expert supervision in a wide range of disciplines. Receive intensive research training before beginning an innovative thesis in the broad areas of health and sport with our integrated PhD program. VU has an outstanding reputation in the sports industry and I had heard about the industry connections and opportunities that are provided for students. Cementing my current position at Basketball ACT has given me the opportunity to work within the industry that I have a passion for and put the attributes I gained during my studies into practice. 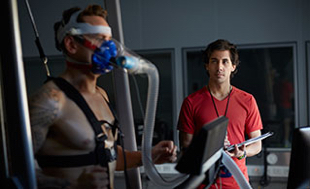 Discover the range of inspiring exercise science courses available from Victoria University. Whether you are interested in outdoor recreation or personal training, we can help get your sports coaching career on track. Learn sports management and benefit from our close links with groups such as the Victorian and Australian Institutes of Sport, Western Bulldogs and the AFL.